Baltimore Department of Planning’s new zoning goes into effect June 5, 2017, replacing 1971 zoning code. It applies to every property in the city regardless of historic district status. In local historic districts the rules of those districts apply, in addition to the new zoning. Simplifying and streamlining the development review. Providing an easy to understand set of rules. Creating a modern code that fosters growth while maintaining neighborhood character. Most cities want mixed-use development. A growing number of people want to live car-free. These are big changes for Baltimore which was an industrial town when the current code went into place. There’s lots to be excited about for those who want to live in a vibrant and walkable city. Under the new code, areas around rail transit stations will have special transit-oriented development designations to allow for denser development. The code also calls for removing parking requirements from some zones altogether and relaxing them in others. A new category known as “Industrial Mixed-Use” would allow obsolete buildings to become artists’ live-work spaces, or workshops for industrial entrepreneurs. Conditional use by ordinance is in the new zoning rules. This is especially unfavorable to small developers who lack political connections. When conditional uses go before the council, politics takes over. The outcome becomes more difficult to determine, adding uncertainty to the process. Conditional use also makes it more challenging for developers to obtain financing. This is especially a deterrent for developers investing in some of Baltimore’s most distressed communities. Multifamily conversions allow for more affordable housing and reduce vacancies. In neighborhoods like Mt. Vernon, many young people living in the apartments could not afford to live in a single family large home that once housed the city’s wealthiest citizens. Subdividing these large homes into apartments make them more desirable as smaller rental units. Under the new code, multifamily conversions are allowed in R-7 and R-8 districts through the conditional use by ordinance process. Under this arrangement, each councilman determines whether they think a multifamily conversion is in the best interest of their constituents. There are no set standards on what makes a structure suitable for conversion. Subjecting multifamily conversions to the conditional by ordinance process creates uncertainty for developers and discourages investment. R9 and R10 districts and ground up developments are based on standard code and do not require conditional use. Among the requirements in the new code are that existing dwellings be 1,500 square feet or more in gross floor area, that each converted unit meet certain minimum gross floor area requirements, and that there be at least one off street parking space for each unit. 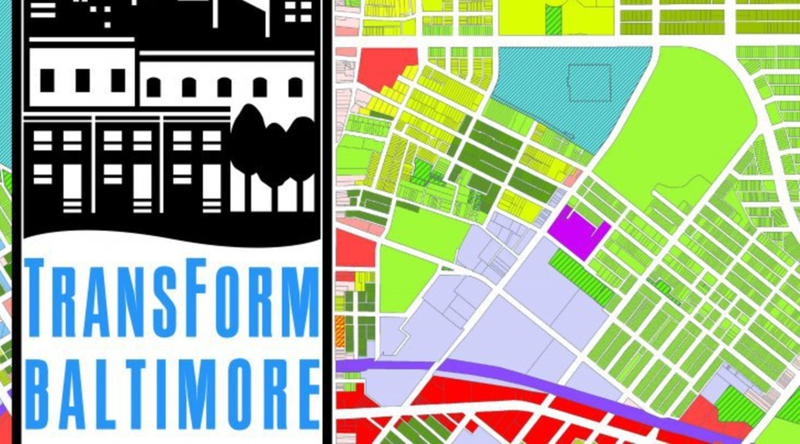 The new zoning recognizes both how Baltimore city evolved and how we would like to see it developed today. Transform Baltimore makes Baltimore a better place to live, work and invest.